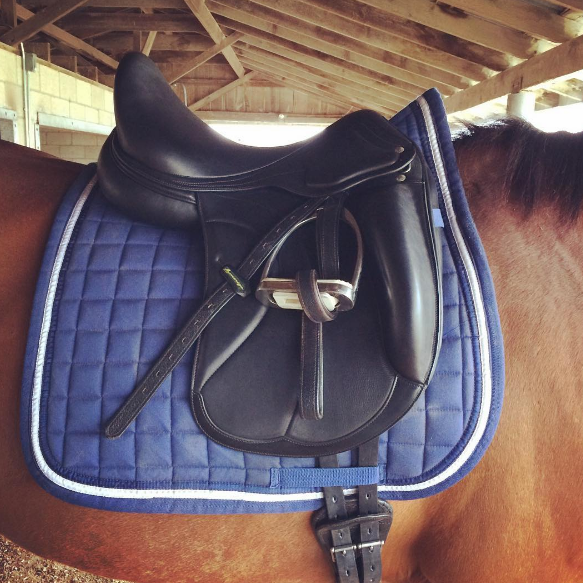 The Amerigo Cervia Siena dressage saddle is fancy, and it wants you to know it. It’s stunning. Crafted from buttery soft calfskin leather, it has a deep, curving seat and large thigh blocks that immediately assure you of a secure ride. 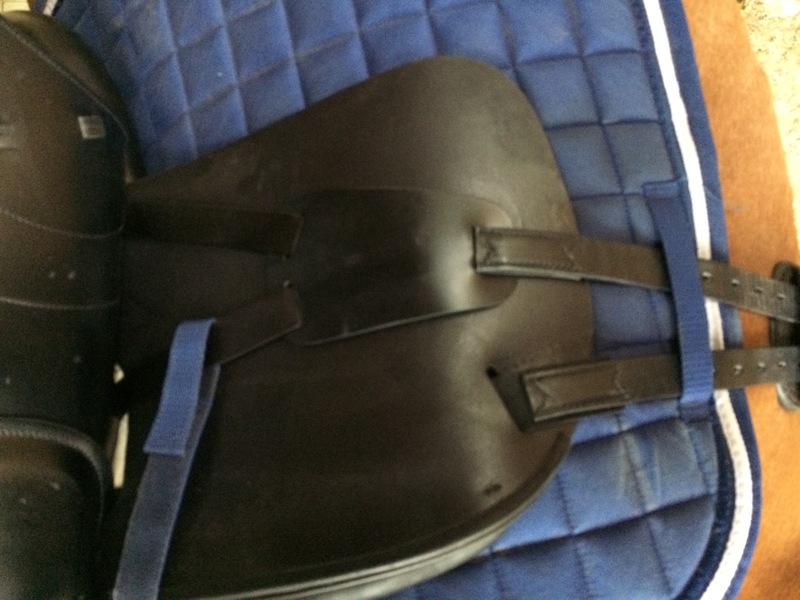 The seat is soft and cushioned, and the panels that sit on the horse’s back are equally pliant. It’s beautiful to touch and see. I tested it out on Gina first. The model consigned at work is a medium tree, and it fit her pretty well. It seemed a touch narrow at the withers, but Gina didn’t seem to notice or mind. From the first moment I sat in this saddle, I disliked it. I felt like it was tipping me forward; Gina is definitely not a downhill horse, but this saddle sure made her feel like one! At all three gaits, I caught myself rocking forward onto my crotch. It wasn’t a good feeling. 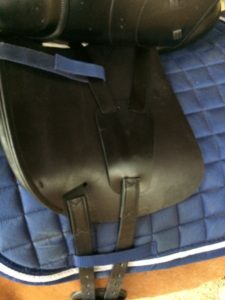 Amerigo’s design philosophy is “to create saddles that allow horses to move freely, with the weight of the rider placed as far forward as possible to minimize strain on the horse’s back,” so perhaps that’s why I felt like I ought to be in two-point. 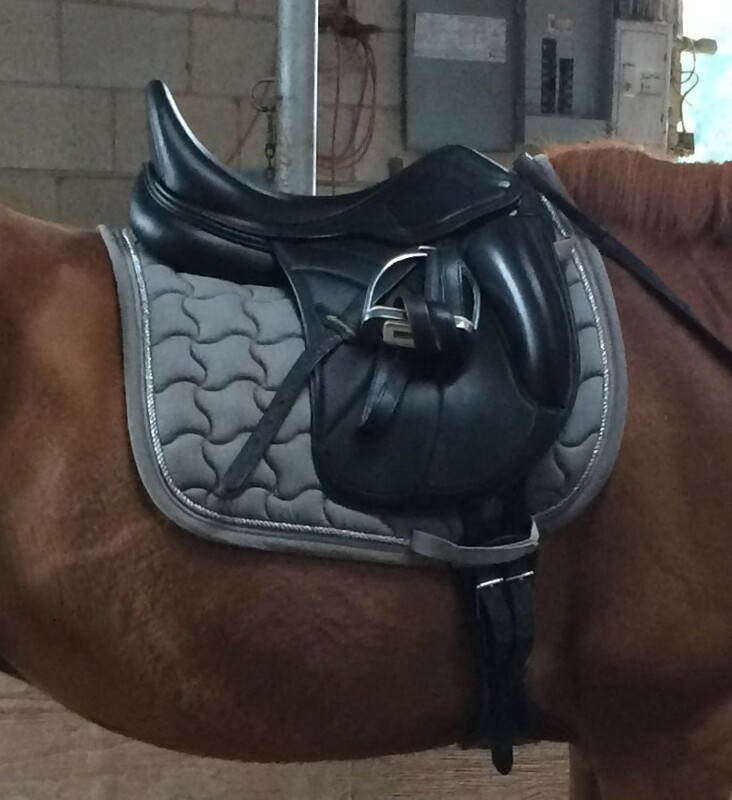 Because I can’t imagine that a saddle which retails for $5500+ new is truly that bad, I also tried it on Moe. The fit was good, although I was a little concerned it might sit on his withers once I got in the saddle. It didn’t, and Moe seemed very comfortable throughout our ride. In general, I liked the Cervia Siena. It’s very well constructed from high quality materials and is extremely comfortable. The short, banana-shaped panels were a good fit for Moe’s short back. I didn’t like how I felt tipped forward at the walk, but I’m willing to believe this is possibly a simple fit issue, since it improved from horse to horse. Overall, it’s a beautiful, quality saddle that’s probably a joy to ride in if it’s fitted to your horse. That’s the last thing I need is to have a saddle tip me forward, but often I find that the case. It looks luxe, just needs the right horse to fit it. I agree- on the right horse, this would be a very nice saddle. They’re definitely suited to a horse with a short back. This was great for Moe (he has a VERY short back), but I’d prefer something with less curvy panels for Gina. I love my Amerigo, partially because of the panels! Dee has a super short back and it’s the only saddle I found that worked in an 18″ but didn’t basically sit on her hip. Plus it’s basically Bum-Candy. On Gina the saddle looks tipped forward from the get-go. Could be the panels aren’t the right shape for her. On Moe the balance seems much better, and could explain why the ride for you felt better. I love your saddle reviews. I’m not surprised you say it made you feel tipped forward… that last picture makes it look almost like a jump saddle.